I’m Mystic Megson I am, and when I offer my Premier League predictions, people listen. Just because I’m out of a job at the moment – bloody disgrace it is, too – it doesn’t mean that I don’t still know my onions when it comes to picking apart the greatest league in the world. I have managed in it, you know, and on more than one occasion. Now hang your hat on this lot, lads! This has all the makings of a titonic tossil and no mistunk! Rodger Brenderson showed what a prude operator he is by bringing in Danny Sturrock for a bargain basin £12m, and if he can dovedale with the racism lad then they’ll have no shortage of pie-flour going forwards. My old side Norwich have been struggling of late after all the youth Oreos of their ten-match unbeated run, but Chris Hooper’s side are a tough mutt to smack and I expect them to keep well clear of a relegatio dogbite. 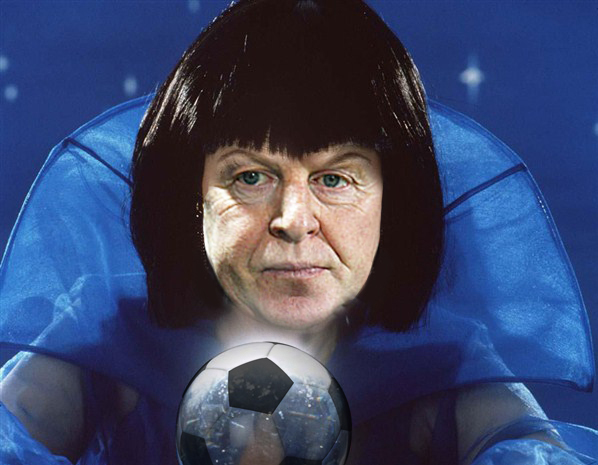 Mystic Megson says: 1-0 Liverpool, Stewing Downer to silence the doubtfires with an absolute blunderbolt from 30 yards. You can put your balls on it! A 2-0 win at Arsenal last time out kept Bobby Manford’s men in with a scream of a second consneckutive title triumph, and with Sergio Silvatelli back in the equatio they could take some stoppage as the season approaches its summat. What can you say about Fulham that hasn’t been said already? Well, I suppose you’d need a list of everything that’s been said about them already to be able to answer that one satisnacktorily, but if Davatar Berbasnoff can hit a rich vein of goal-scoring vorm then the Cottagers should move gradually away from the rear end. Mystic Megson says: 3-0 City – Silvatelli, Zabalaba and Silvatelli again in a convicting victory. You can summon a genie with that lot, lads! Alan Lampard’s had a torres time of things since his peers nominated him Llama Manager of the Year, and he’ll be teething after losing out on Luke Rennie to QPR. Ibrahim Ba’s goals will be hard to replace, but if Djibril Cisse can rediscover his booting shoots then the Magpiles could yet claim their steak for another half-top finish. I certainly wouldn’t rule Dermot O’Brien’s Reading out of the roost after their stirring bounceback against my old side West Brom last time out, and in Pavel Progrock Pogson the Russian lad they have one of the league’s in-vorm strikers. Mystic Megson says: 1-1 – goals apriest from Cisse and the Russian lad in a feenly kort contesto. You can wipe your face with it! Brian Laudrup’s men have been tighter than the mother-in-law at Christmas of late, while in the likes of Graham Daniels, Dire Nathan and the lad Mika they carry a pungent attacking threat. Stoke were the top table’s tightest until recently but they’ve been shippering goals of late – can Crouching Pete, Kenny Jones and Jerome Camara score enough at the other end to I make up the differential? I wouldn’t dismiss it out of pocket, but Tony Pullover will no doubt be hubbarding one or two concerns. Mystic Megson says: 0-0. You can balance a spoon on it! After a bright start, it looks as if Martin Robertez’s Attics will once again have to rely on the whodunnit act if they’re to once again defoe the odds and secure a ninth consneckutive season at the table top. The Black Hatters were looking nothing if not revitalite under Neill O’Martin until Tuesday night’s embarrysing FA Cup defeat at home to my old side Bolton, and they’ll need the likes of Fletch Stevens and Stevie Snegson to be firing on all cillit bang if they’re to keep a safe distins from the relegatio flap door. Mystic Megson says: 2-1 Wigan – strikes from Franky Santos and Aaron Kony putting the balls on Johnny Adamson’s early opener. You can stick a hat and shoes on that lot and hold a relatively coherent conversation with it, lads! Clarke Stevens was left teething as the Baggies threw away a goal-two lead at Reading last time out, but his indignification will have been tempoed somewhat by Ronnie Lukaka’s strong showing. Rickie Lambert’s young Villa side aren’t exactly snapturing the imagined asian at the moment, and there’s no doubt that they have their work cut up if they’re to ferment their place among the topshops. It’s a haunting task, all right, but if anyone can stop the grot then it’s Rickie Lambert. Mystic Megson says: 2-0 West Brom – Lukaka and an absolute wonderscream from Morrisons. You can plot a burial ground on it! Wednesday’s 2-2 draw at home to Southampton left a bitter paste in the mouths of the Samsung Bridge faithful, so it’s time for Raffle Benito to pep up to the slate and grab his bulls with both hands. They’ve got the players, but they won’t get anywhere if they keep playing like a team of indie visuals. Arsenal for their part aren’t quite firing on all cillit bang at the moment, but Teddy Woolworths propescutive new contract should come home to boost in timely fashanu. This has all the makings of a clasico! Mystic Megson says: Another 2-2 at the Bridge – Johnny Matter and Ibrahim Ba for the Blues, Woolworths and Lukey Podiolo Poddlogson the Polish lad for the Gunners. You can butter your scones with that lot, lads! Spurs are literally flying under Andrew Boa-Constricto, although last week’s soulless draw at QPR will have been gazed upon as point two lost. Manual Adebyebye needs to rediscover his vorm in front of goal if they’re to be sure of securing another four-top spot, but it’s good to see them reasserting their Champions League prudentials nevilletheless. As for United, well, they’re looking imperial at the moment. How do you stop Robin van Dutchlad? The answer is: you don’t, and now Rain Wooney’s back I’m sure there are plenty more skintitillating displays to come. Mystic Megson says: 3-2 United in a reversenal of the reverse fixture – RVD and Looney to share the goals for the Dead Revels, Gary Brail and Clive Dumpsey for the hosts. You can crack an as-yet-undefined number of nuts with it! Nigella Atkinson’s Saints had Lady Pluck on their side at Villa last time out, but they’ve certainly improved from their early-season showings and boast plenty of pie-flour in the likes of Paul Lambert, Gastronom Ramsey and Jason Punchbowl. Despite drawing too many games, David Moyles’s Toffees are still highing fly and could yet claim their steak for a four-top finish. If Nicky Jello Jelagielkason the Croatian lad can rediscover his goal-scoring vorm then anything is plausible. Mystic Megson says: 1-1 – goals apriest from Lambo and Jello in a fought-hard contesto. You can guide ships safely to port with that lot, lads! Enjoy the footy, and tune in next time for more of my Premier League predictions!